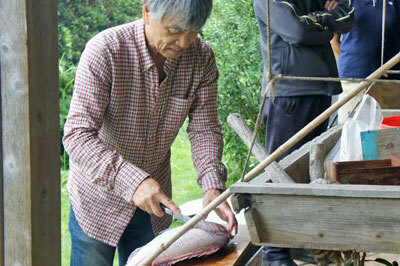 After retirement, Naoto began to enjoy "country life". He rented an old farmhouse and a paddy-field and started rice cultivation in strictly organic manner. He even tries to avoid industrial machines as far as possible and follows traditional manual working style. Though the size of his paddy-field is not large, some 20a, it is obviously impossible for an unexperienced farmer to cultivate it alone according to his ideal. Fortunately, he knows many young students who are glad to work with him in his paddy-field as volunteers, because he was professor at Chiba University till he retired in spring last year. In September, he was about to start rice harvesting in his second year as rice farmer. He did not expect old men like me to help him in rice harvesting, but was kind enough to invite me to see his estate when he was not too busy in his farm work. 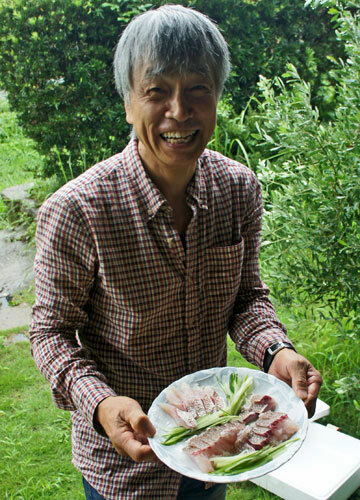 His farm is located in Otaki. Otaki is a tiny old castle town in the south of Boso Peninsula, Chiba Prefecture, about 100km away from my house in Tokyo. However, it does not take much time to reach there. It takes less than two hours by omnibus from a stop near JR Tokyo station. Our bus trip was comfortable, but the weather was unfortunately not ideal for farm visit. When we arrived in Otaki, it was raining cats and dogs. 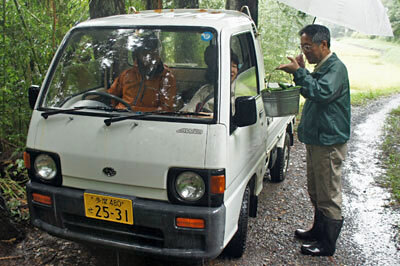 Naoto has a small pick-up truck to carry us, but there was only one seat except for driver. Therefore, my wife sat next to Naoto and I and a friend, Ken, were requested to stand on the cargo bed. I expected such a situation and put on a proper rain wear from top to toe, but Ken did not and put up a transparent vinyl umbrella to protect himself against heavy rain. Then, we started a tour to Naoto's paddy-field. Soon, we realized that it was not convenient to drive on cargo bed with a vinyl umbrella. Rain and wind were of course problematic, but the plants growing closely to narrow farm roads were more dangerous. In many places twigs and vines, sometimes with sharp thorns, were hanging densely over the road and forming green tunnels. Every time we saw obstacles in front of us, we had to kneel down to hide us behind driver's cabin. It was as if we were enjoying an "Adventure Land" attraction of Disney Land. Upper left: a small stream is flowing between woods and paddy field and thousands of fireflies can be seen here. 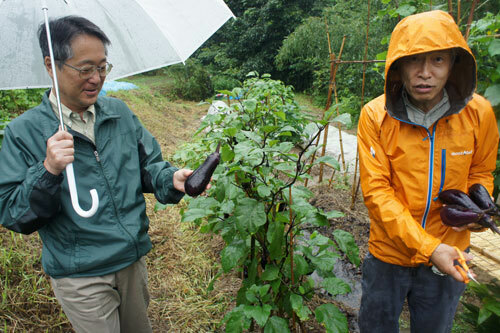 Right: Ken (left) and Naoto with freshly plucked egg plants. Lower left: Naoto's pick-up truck. We stood on its cargo bed. 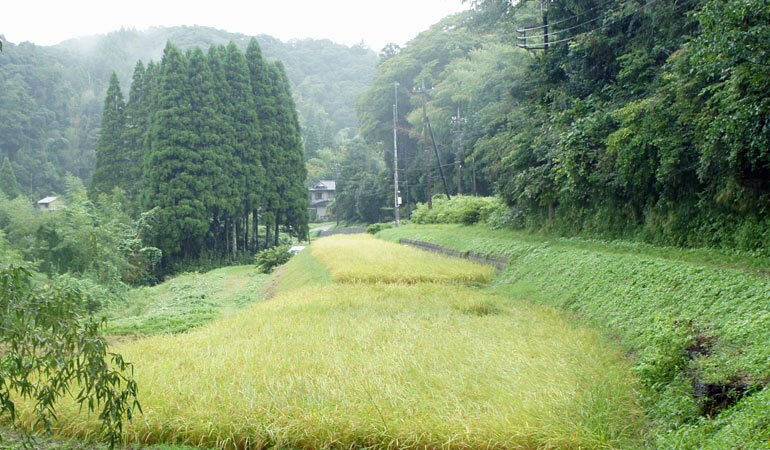 Naoto's paddy-field was full of ripe rice plants which were ready for harvesting. I was a bit worried, because I thought that the continuous rainfall might damage ripe rice before harvesting. But, Naoto did not mind much about rain fall. He explained us that the weather conditions were vital for certain stages of rice plant growing, but the rain on these days did not matter much and he could dry seeds anyway. Then he guided us into a warehouse and showed us several tools which were used since the feudal time until the 1950s, when mechanization started in Japanese farms: buckets for sprinkling water, weeding tool, thresher, rice-straw-rope maker and so on. They were not in use anymore and Naoto collected them from local farmers. (Unfortunately no photos ;-( as I did not have my camera there.) The area where his paddy-field is located, Shoritsuji, is not far from the center of Otaki which has more than 10 thousand inhabitants. But, mountains lie between Shoritsuji and the city center. They are not high but thickly covered by woods and separate Shoritsuji from the city life. 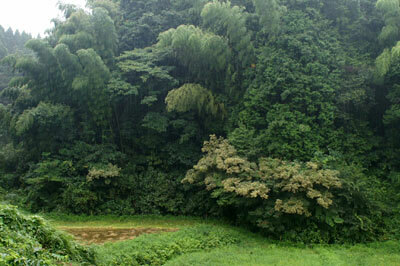 Shoritsuji is therefore very quiet and surrounded by greenery. Naoto has some vegetable fields next to the paddy field. Egg plants, cucumbers, myoga gingers and other vegetables were growing there. Naoto took some for our lunch barbecue and we went further up in the mountains. When we reached the end of the road, we felt as if we were in remote mountain area. However, when Naoto measured its altitude with his altimeter attached to watch, it was only 54m! Naoto explained us that thousands of fireflies can be seen there, though the site was not known to tourists and only a few neighbors enjoy their mysterious glows. Upper left: Naoto dressing a big sea bream which was caught in the morning in the nearby sea. 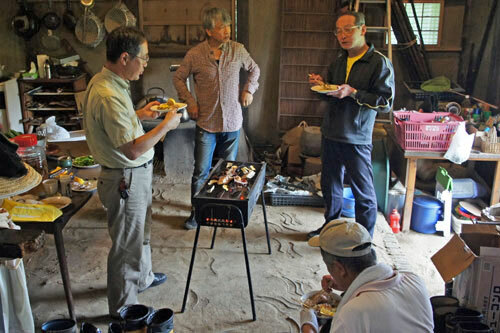 Right: barbecue oven was set in the house, because it was raining. 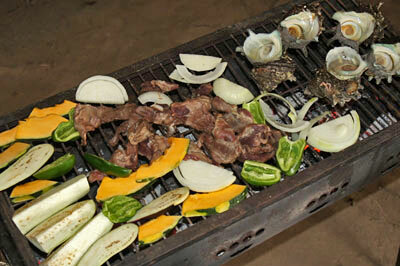 Lower left: wild boar meat and turbo were grilled together with vegetable. 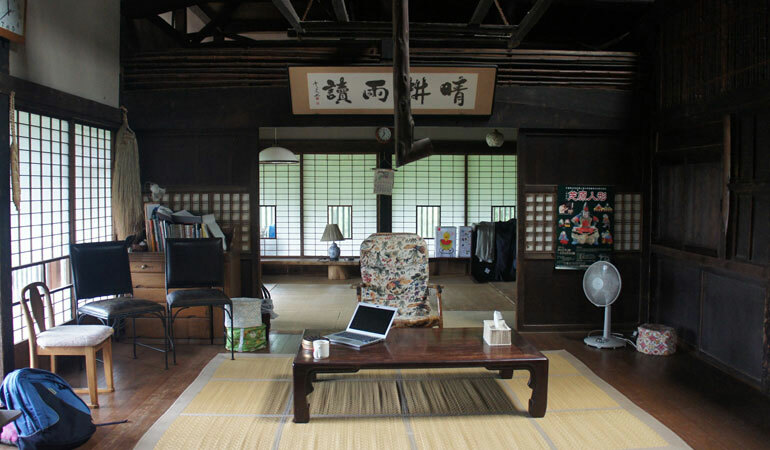 The farm house which Naoto rents together with some others is about 150 years old and it was brought to the present place from a distant village, because the owner of the house found it appropriate to maintain this old house in proper manner. After renovation he offered friends to share it with him. Though it looks very old, we can see many partial innovations so that the life in an old house is made comfortable for the people who are accustomed to the luxury modern life. Naoto invited some friends from the neighborhood, who either live here or have here their second house and enjoy country life. It was amazing that they all could manage household smoothly. They could dress big fishes with astonishing easiness, make fire in oven and prepare barbecue with various types of meet and vegetable. They all are enchanted by the life here. They also try to revitalize the community together with the local people. Depopulation, aging and declining economic activities are the common difficulties our local communities face. Naoto and his friends might be able to work together with the local partners to find new ideas and implement them. Tatami rooms in the Naoto's farm house. I got to know Naoto, when he started to work at United Nations Industrial Development Organization (UNIDO) as its professional staff. After more than two decades of working for the development of African, Asian and other developing countries, he happened to get fulminant malaria during his field work in Africa. He was forced to stay in hospital doe months. Fortunately, he could survive the difficult time and leave the hospital, but could not fully recover his health. Doctors did not allow him to go to tropical countries again, because another malaria infection might be lethal to him. So, he had to retire UNIDO and fortunately found a post at Chiba University. Naoto shows sea bream "sashimi" which he just prepared. Now, he appears to fully enjoy his life. I believe that farming really fits him, it might resemble development projects he had in his favorite Africa. Though he still lives in his house in Mitaka, a suburban city of Tokyo, together with his family, he stays in Otaki three to four days a week. The only headache he has is that his better half Nao-chan does not much like country life, as she was born and brought up in Tokyo and like most woman in the similar situation, she is fond of urban comfort. This is the common problem to many country-life fans. They like country-life, but their wives NOT. 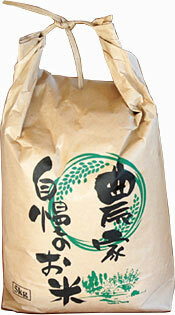 After a few weeks, newly-harvested rice was delivered from Shoritsuji to my home. We cooked it right away and ate. When rice was cooked sweet fragrance came up and each grain was glittering. Compared with popular kinds of commercial rice, its taste was a bit plainer. However, taking into consideration that it is organic rice and it was made by an amateur farmer who started farming only two years ago, the quality of Shoritsuji rice was excellent and we could enjoy it very much.